Picture 1. Unprocessed HDR image looks bad because monitor can't display it properly. This HDR tutorial concentrates in tone mapping in Photomatix Pro 3.0. Besides tone mapping I'll do some preprocessing and postprocessing in Photoshop. Tone mapping is the process in which the colors of an HDR image are mapped to a normal image (LDR). In other words the dynamic range of an HDR image is reduced to fit into a normal image (LDR). In picture 1 you see how unprocessed HDR image looks like in Photoshop. It looks pretty bad because today's monitors can't display the dynamic range of an HDR image. I have two goals with this HDR photo. Firstly, I would like to emphasize the windmill and bring out all it's beautiful details. Secondly, I would like to create a warm fairy tale like feeling to this HDR photo. Picture 2. HDR image after clean up in Photoshop. Before the actual tone mapping I do some Photoshopping. This is a good phase to do Photoshop processing because I am still working on 32-bit HDR image. In 32-bit mode I could do radical image processing operations without loosing any image information. At this time I only want to do a basic clean up. In my opinion there are distracting background elements behind the windmill. I use Clone Stamp Tool and other copying methods to remove the background trees. In picture 2, you see the photo after the clean up. Picture 3. HDR image in Photomatix. In picture 3 you see the how my HDR image looks like in Photomatix. 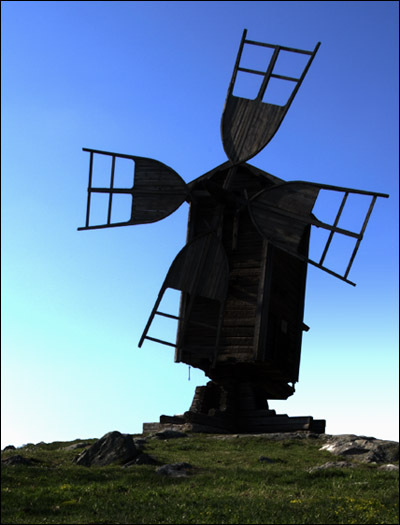 The image has extreme contrast and the windmill is depicted almost black. Photomatix's HDR viewer can be used to inspect the image small region at a time. HDR viewer always tries to show the pointed region with an optimal exposure. Picture 4. HDR photo with the default settings of details enhancer. Let's start the tone mapping process. Tone mapping in Photomatix is pretty simple to do because the software is very user friendly. Each tool has a real time preview and a small footnote explaining its meaning. Details Enhancer is opened by clicking on the Tone Mapping button. Details enhancer is one of the two tone mapping methods available in Photomatix. In picture 4 you see the image with the default settings of the Details Enhancer. The default settings are a good starting point. 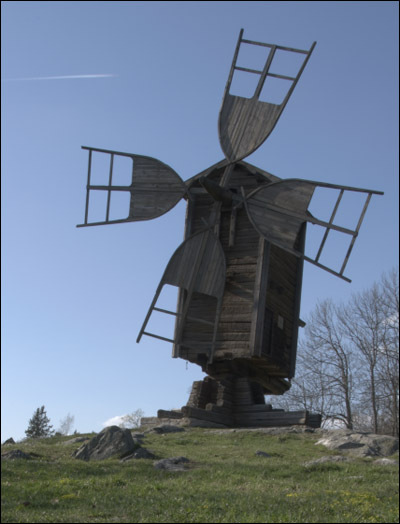 The preview window already shows a lot of details in the windmill without blowing up the sky (picture 4). Picture 5. Strength adjustment in the tone mapping process. Strength setting controls the strength of contrast enhancements. You can see the effect of the strength adjustment in picture 5. (If my goal was a realistic photo, I might use a lower strength value). Picture 6. Increased global contrast. I push the contrast very high on purpose because later on I'll be making adjustments that bring out details but decrease the contrast. Gamma adjustment makes the whole image a little brighter. All in all these three settings work like Levels in Photoshop. Picture 7. Colors are made warmer. Moving the slider right gives warmer and more yellowish look, and moving the slider left gives colder and more bluish look. I'm going for a fairy tale look, so I need really warm colors. Picture 8. Saturation is increased. I want colorful picture so I use the highest value possible (picture 8). Picture 9. Lower Light Smoothing value brings out details. Light smoothing controls smoothing of contrast variations throughout the image. My adjustment brings light to the shadows and brings out wonderful details. Unfortunately this setting also causes clearly visible halo around the windmill (picture 9). I'll fix that later. Picture 10. More light with the Luminosity setting. Increasing the luminosity boosts shadow details and brightens the whole image. It also seems to decrease the halo effect. Picture 11. Micro-contrast can be used to emphasize small details. 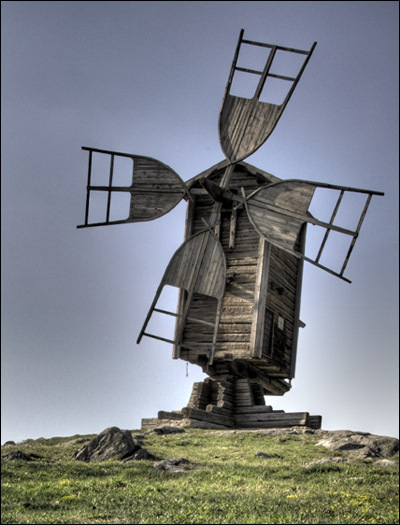 This setting emphasizes the small details of the windmill. Picture 12. Micro-smoothing smoothens the sky. As a result I get noise free sky and at the same time probably lose some details in the windmill. Picture 13. Highlights Smoothing can be used to remove halos. I use the largest value available to remove the halo as well as possible. Picture 14. Final image after tone mapping. Finally I click Process button and Photomatix executes the actual tone mapping process. Now the image isn't an HDR image anymore. Notice how the image in picture 14 looks slightly different from the the preview in picture 13. The final image is darker. Now the tone mapping process is completed. I'm still not completely satisfied with the image so I'm going to do a few adjustments in Photoshop. Picture 15. Final image after tone mapping and Photoshop processing. I right click on the selection and choose Layer via copy to create a new layer from the sky. I apply Surface Blur filter (Radius: 100) and get a silky smooth sky. This operation removes the noise completely. I apply Hue / Saturation adjustment layer to boost the saturation of yellows by +30. After this the windmill looks wonderful but the grass looks too saturated. I just paint the mask of the Hue / Saturation layer to remove the effect from the grass. In the end I sharpen the image by converting the bottom layer to smart object and adding Smart Sharpen filter to it. In Picture 15 you see the final image after tone mapping and photoshop processing. HDR Photography - What Are HDR Photos?